Great misunderstanding surrounds the many deities of Buddhist tantra. On the surface, the veneration of tantric deities looks like polytheism. And it's easy to assume that a "goddess of mercy," for example, is someone you pray to when you need mercy. There are folk practices throughout Asia that employ the deities in a similar way. But this is not how tantric Buddhism understands the deities. First, what is tantra? In Buddhism, tantra is the use of rituals, symbolism and yoga practices to evoke experiences that enable ​the realization of enlightenment. The most common practice of tantra is deity identification or realizing oneself as a deity. Often a teacher chooses the appropriate deity to match a student's personality and spiritual barriers. 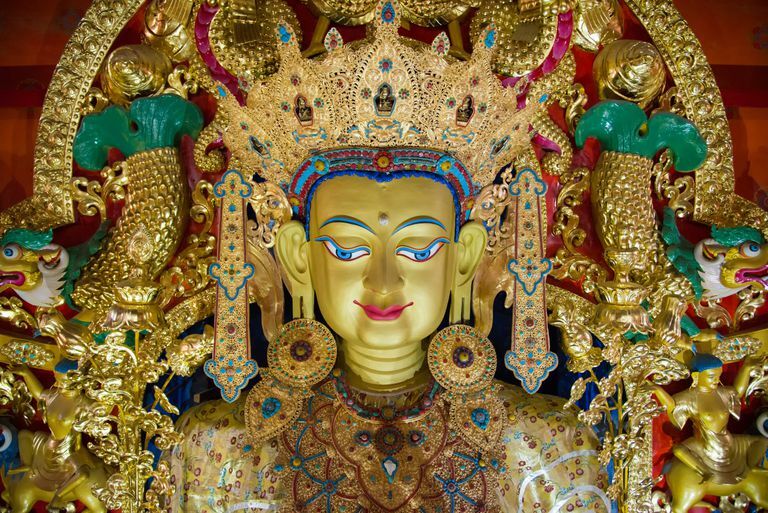 To understand how deity identification works, we need to review some Buddhism basics. All Buddhist teachings begin with the Four Noble Truths. The Buddha taught that the frustrations and dissatisfactions (dukkha) we feel about our lives is created by grasping and greed, which in turn is a result of our misunderstanding ourselves. Mahayana Buddhism teaches that, in our deepest selves, we are already perfect, complete and enlightened. However, we don't understand ourselves this way. Instead, we are caught up in the delusion of ordinary appearances and conceptualizations to see ourselves as limited, imperfect and incomplete. Through tantra, the practitioner dissolves the limited conception of himself and experiences the boundlessness and perfection of Buddha nature. There are three prerequisites necessary to tantra practice. They are renunciation, bodhicitta, and understanding of sunyata. Renunciation: In tantra, "renunciation" does not mean giving up comforts and pleasures, eating nothing but gruel and sleeping on rocks. Instead, it means letting go of expectations that there is something outside ourselves that can give us happiness. It's fine to enjoy what is beautiful and pleasurable in our lives, as long as we don't needily cling to them. Bodhicitta: Bodhicitta is the compassionate wish to realize enlightenment for the sake of others. It is only through the open heart of bodhichitta that enlightenment is possible. If enlightenment is something you are trying to acquire only for yourself, it becomes just one more thing you are trying to grasp to make yourself happy. Sunyata: Sunyata is the Mahyana Buddhist teaching that all phenomena are empty of self-essence. Shunyata also is an absolute reality that is all things and all beings, unmanifested. Understanding of sunyata is essential not only to understand oneself but also to prevent deity identification practices from devolving into polytheism. The tantric deity with which a practitioner identifies is empty of self-essence, as is the practitioner. For this reason, the tantric practitioner and the deity can be realized as one boundless being. If one is serious about taking the tantric path, it is necessary to work with a teacher or guru. A good teacher brings students along at the appropriate pace, introducing new teachings and practices to them only when they are ready. This article is only the briefest of introductions to a vast subject. The many schools of Vajrayana Buddhism have several highly complex systems of tantra that have been developed over many centuries. Learning about them all is a lifetime's work. And I don't think the tantric path is for everyone. But if what you read here resonates with you, I hope you will take the initiative to learn more about Buddhist tantra. What Is Buddhist Tantra Really All About? Who Was Tara in Buddhism? What Can the Tibetan Book of the Dead Teach Us?